Learn about herbs for medicinal uses. All sorts of teas offer diuretic properties, but parsley tea offers much more. Parsley's botanical name is Petroselinum crispum and it is part of the Umbelliferae or carrot family. Herbalists will tell you all sorts of things that are special about parsley. It's more than a garnish; it's rich in iron, vitamins A, B, and C, and contains trace minerals. Every part of the parsley herb is used for medicinal purposes. Some of these include bladder and kidney problems, arthritis, sciatica issues and even rheumatism. Parsley tea is an easy way to gain some essential nutrients from a refreshing and healthy drink. Hot or iced, parsley tea is being used more and more by herb gardeners and organic shoppers alike. You can even find some fresh parsley that is organic. So how do you make parsley tea? It's best to make parsley tea from fresh parsley, not the dried variety. You can chop fresh parsley and allow it to dry, just skip the bottled parsley to reap the best nutrients. To make a cup of parsley tea, begin by chopping approximately one-quarter cup and set aside. Bring one cup of water to boil in a teakettle or saucepan. Once the water is boiling, pour it over your freshly chopped parsley and let it steep for around five minutes. After the steeping process is done, use a strainer with your favorite mug underneath and pour the parsley tea. Make an entire pot by adjusting the ingredient measurements. Some people say parsley tea is bitter and only endure the flavor for its nutrients and health benefits. Others sweeten parsley tea or enjoy its bold, tart taste. The strength of parsley tea is a personal preference and if steeping it five minutes is too rich for you, try steeping it a little less or using one-eighth cup of chopped parsley to make it less bold. Every part of the parsley plant is used for medicinal purposes including the seeds, the root, and the leaves. This makes it quite versatile in a wide variety of herbal uses. Parsley is easy to grow. It requires little sunlight and prefers rich soil to thrive. When you think of your herbal garden, find a nice little corner for some parsley so you'll some handy for cooking and parsley tea. You can even choose from two varieties, the curly type or the flat leaf type more commonly known as Italian parsley. 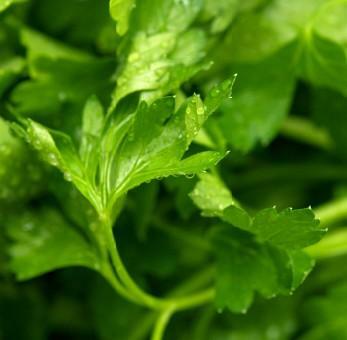 If gardening is not your game and you want to reap the health benefits of parsley tea, this herb is probably the most abundantly sold herb today. You can find it in health food stores, conventional grocery stores, and farmer's markets. You can tell which is the freshest parsley. Look for parsley that is full of spring with bristly leaves and as green in color as you can find. If you choose to purchase fresh dried parsley, consider purchasing small amounts because once it is dried it begins to lose its color and flavor. Whether you purchase fresh or dried, store in an airtight container and keep away from strong heat sources and humidity. Once you've tried parsley tea for its health benefits, why not become the expert in parsley and its uses? Share your parsley tea recipe with others, find other ways to enhance the flavor of your tea or consider new ideas or uses for parsley. Herbal gardeners and organics alike have found many uses for parsley, including the rich and bold tasting parsley tea. This inexpensive herb is great to share with friends, family members, and community groups.